(02-12-2017, 04:48 PM)Miguel Wrote: What was she replying to? It's either a joke or a new 'fashion trend'? @haleyreinhart lol haven't heard that in a WHILE! So I've had three tweets of mine liked by Haley as of late. Very grateful for that because she doesn't have to randomly like fans tweets. Anyway... The most recent one involved me being excited for album number 3's photoshoot. I really can't wait to see what theme she goes for, for this album! I almost missed my chance to post this #fbf pic of the gorgeous and unbelievably talented @haleyreinhart Peep who's in the background? ? #SweetDreams loves ? @vintage_opium Yes!! Have you heard her rendition of Creep? Gives me chills! She has such a unique and powerful voice, I love it! Kind of unusual for Haley to respond to somewhat random Instagram posts. 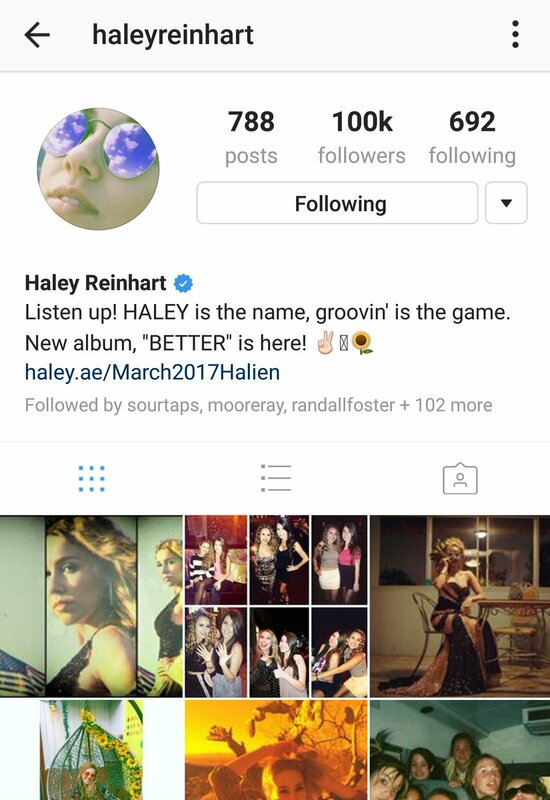 (03-13-2017, 12:29 AM)Miguel Wrote: Kind of unusual for Haley to respond to somewhat random Instagram posts. Hot to trot! #ladiesofpmj #pmjtour #creep #sna #allaboutthatbass #paris #tonight!